Edo tribunal: Recounted ballot papers show discrepancies with INEC’s figure The result of the recounting of ballot papers used for the conduct of the September 28 Edo State governorship election in three local government areas has shown discrepancy in the total number of figures announced by the Independent National Electoral Commission (INEC) and that recorded during the recounting exercise. 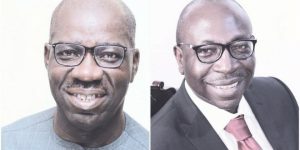 The Peoples Democratic Party (PDP) and its candidate, Pastor Osagie Ize-Iyamu, are challenging the declaration by INEC of Godwin Obaseki of the All Progressives Congress (APC) winner of the election and have listed INEC, Obaseki and the APC as first, second and third respondents respectively. In its ruling on February 9, 2017, and subsequent orders, the three-man tribunal headed by Justice Ahmed Badamasi granted the prayers of the PDP and Ize-Iyamu by ordering the recount of ballot papers used for the conduct of the election in Egor, Akoko-Edo, Etsako West and Etsako East local government areas. The recounting exercise, which was held between February 9th and 10th, was, however not concluded before the expiration of the period given to the petitioners to prove their cases, but afforded the petitioners enough time to conclude the recounting exercise in some wards in Egor, Akoko-Edo and Etsako West local government areas. In the report that was signed by the assistant secretary to the tribunal, Buhari Sani, for the secrtary and given to parties in the case, the recounting exercise was concluded in Wards 1, 2, 3, 4 and 5 in Etsako West Local Government Area, Wards 1 and 2 in Akoko-Edo Local Government Area and Ward 1 of Egor Local Government Area. Most striking was that of Etsako West Local Government Area, where recounts showed that a total 8,432 ballot papers were used in the five wards covered by the recounts as opposed to 17,138 that was recorded in the form EC8A by the INEC. In Ward 1 of Akoko-Edo Local Government Area, recounts revealed that more ballot papers were used than the figures recorded on the Form EC8A as recounts showed that 3,206 ballot papers were used as opposed to 3,167 recorded by INEC. In Ward 2 of the local government, recounts showed that 3,849 ballot papers were used, while 4,161 was recorded on the Form EC8A by the INEC. In Ward 1 of Egor Local Government Area, recounts indicated that 3,217 ballot papers were used in the eight units of the ward, while 2,770 ballot papers were recorded as used on the Form EC8A. The tribunal resumes sitting on Thursday with INEC opening its defence of how it conducted the election.